Just when winter turn to bitter cold, the snow deepens , and we dream of spring. Thoughts turn to the possibility of a long walk. Here’s some sound advice for those of you who are considering a walk in the woods, from my friend Joe. I have backpacked since joining the Boy Scouts ( 1966…) and many of the things that I take for granted seem to fade into my own psyche until I see somebody else struggling with the obvious elements of how to have a successful trip. Yes, folks, at present I am old and fat, but I still know how to have a good time and to feel comfortable when hiking….. I suppose this is because I have had my share of terrible camping experiences, and learned from each time. On this present trip I got up close and personal with a few hikers that were totally new to this sport. I could have stayed my distance, experiencing the schadenfreude of their trip, but I tried to be useful without being too directive. I do have some advice, before you go. Close call for the Carrot. Hard Lessons on Mount Saint Helens. 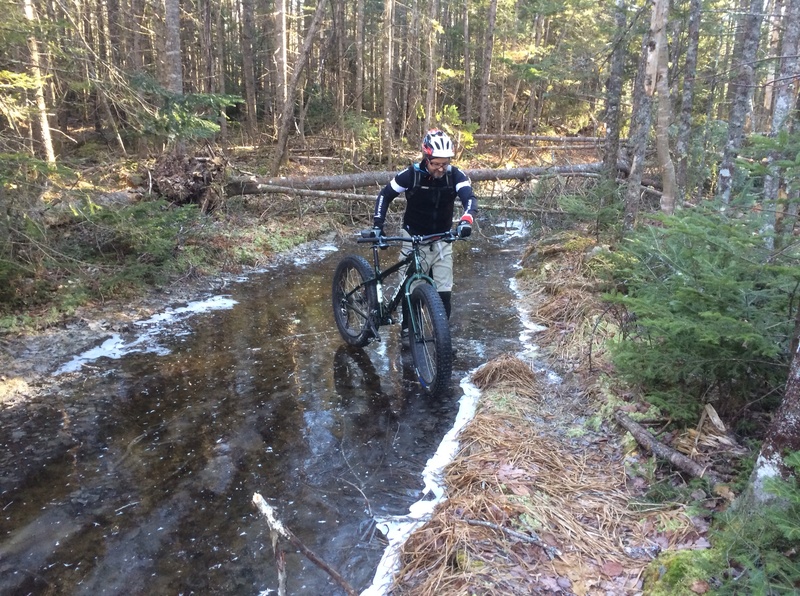 We depend on freeze thaw cycles in order to ride our bicycles over the snow on the trails here in midcoast Maine. That hasn’t occurred lately. It didn’t happen this weekend either. Nevertheless, I’m pleased to have put in two rides, back to back, in less than optimal conditions. I’m pumped to start 2015 by getting outside again. On Saturday I joined 4 other Bubbas in the Woods members for my first ride in 2015 from the Warren Community School parking lot. It was as brutal a cold that I’ve ever rode in. Even at the usual 9:30 am start time, Nate said it was only 1 above zero when he left his house in Union. It might have crept up to single numbers after our two hour ride, but not by much. How does one deal with moving through cold like that? I am used to the cold, but my fingers and toes aren’t. With a resting pulse of a turtle, and 6’2” of height, by the time my core heats my blood up and pushes it to my extremities, I don’t retain heat way out at my physical fringes. I had to take off a shirt layer after the first big uphill in Warren, but needed extra help to keep the digits happy. I needed three sources of protection for my hands today: winter gloves, inside pogies ( oversized handlebar-end covers), with reusable chemical heat packs wedged between my gloves and the pogies. My feet survived the cold with the help of toe-sized chemical heat packs stuck to the top side of my thin woolen socks, inside some ancient LLBean rubber bottom/leather top hunting boots, with pair of thermal mesh air soles between the bottom of my sock and the boot. I moved to flat pedals last season, after suffering through too many winters with clip on pedals and winter biking shoes. 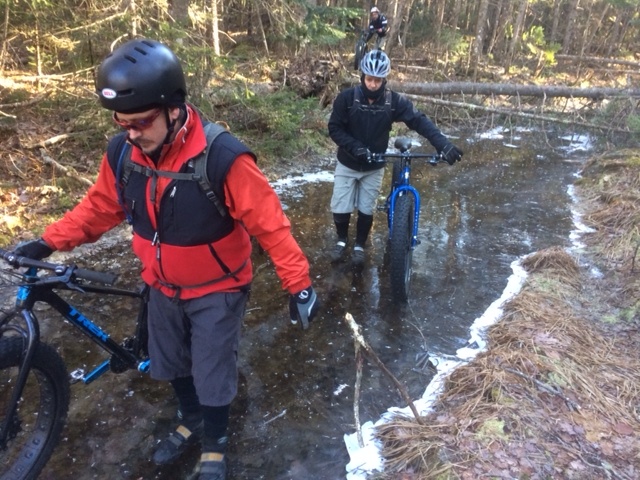 If oversized boots and flat pedals get picked to ride the Alaskan winter trails, I’m down with that. How was the riding ? It’s hard to be objective. Last winter, this same Warren route was so good. We had an ice highway running through these woods. There was plenty of snow, with numerous snowmobiles packing the track, and a cycle with warmer days , then drops below freezing each night. This snow out here is not solid on top. While most of the trail today was decent, there were sections where the snowmobile track was pitched to the side, with the bikes siding sideways as we churned forward. You also absolutely had to ride within the narrow snowmobile track. 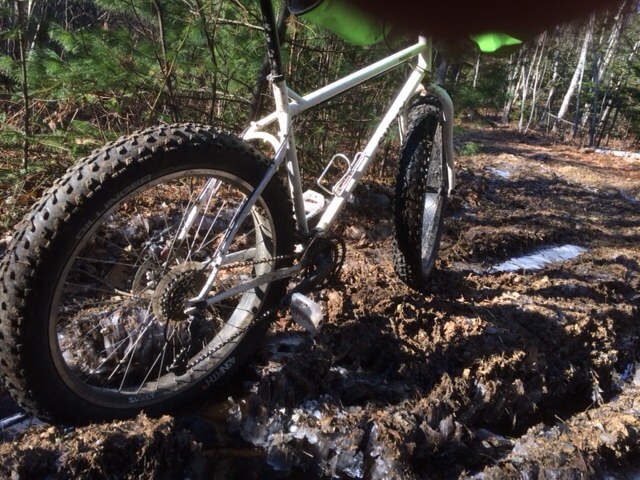 When I found my front wheel outside that, onto the ski track of the snowmobile, I went sinky, and often stoppy. It’s more work riding on the snow. It felt like fifteen miles of riding in Warren, but was only eleven. For very next day, Sunday, the weather pundits prophesied a whole different story: morning rain and temperatures rising to the upper 40’s. The wonder of the imternet and subsequent weather Apps opens a whole new world to us who watch the weather to plan out outdoor adventures. We learned that it would stay freezing until day break, when the temps would rise and the rain begin around noon. Jason Buck led Blaine and me on a most enjoyable ride around the winter-only riding trails that encircled the little town with the big name: Hope. But to get in on this ride, you had to be ready to leave from Hope Center at 8 am, a time change that left most of the faithful still sleeping. There was no way I was going to miss this ride. I am currently obsessed with the ideas put forward in Microadventures, an e-book by Alistair Frasier. 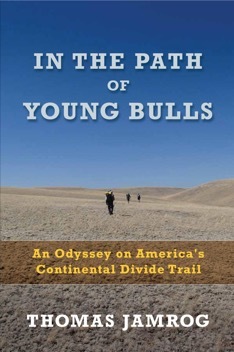 it will be released as a traditional book in march 2015 in the US. In it, Frasier lays out practical suggestions on having hiking, biking, and even river swimming adventures in one’s own local community. 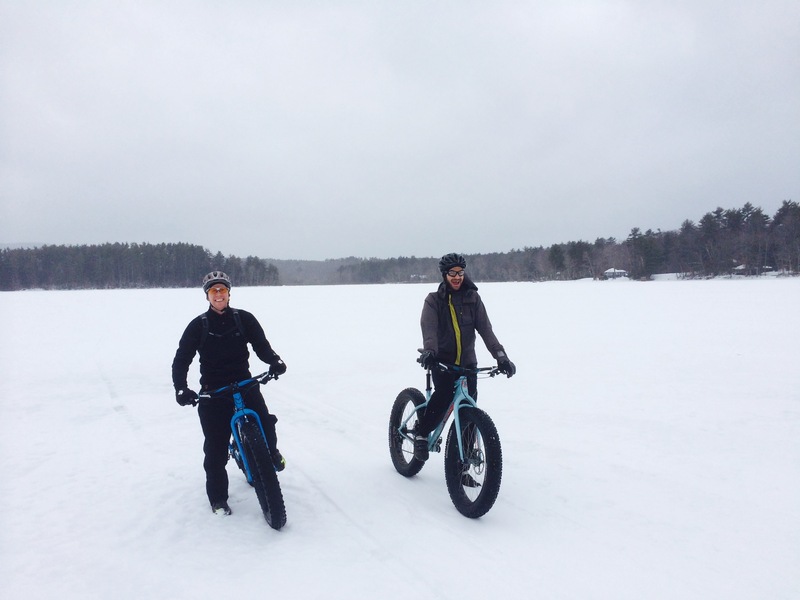 We had our own genuine microadventures this morning: riding through ancient farmland, exploring frozen bogs and swamps, and even pedaling over the surface of Megunticook Lake, where a view like this opened up glimpses of distant mountain that are not available any other time of year. For the first hour and a half the Sunday ride was solid, on snowmobile trails that had been well traveled. We zipped along at a good clip, over, up, and down moguls that sometimes pitching us side to side until we eventually descended to the North shore of Megunticook Lake. 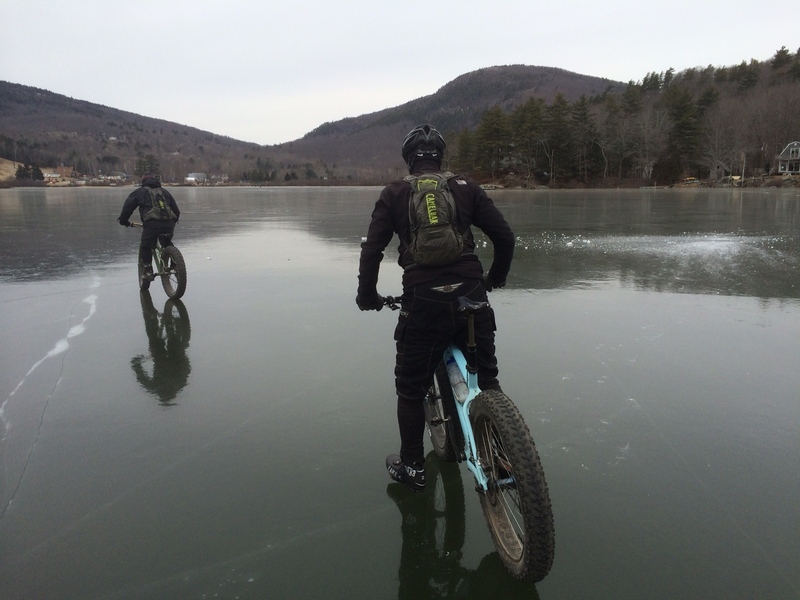 I have walked and rode over many frozen lakes. There were tracks from snowmobiles and ATV’s that we followed, but not much was solid on the big water. We hit stretches of slushy ice, due to the recent snow layer insulating the ice below from the deep cold above. We there are springs in the shallows that also result in open water holes that also have to be avoided. I particularly enjoyed riding up a very narrow frozen stream between Megunticook and Norton Pond where we threaded our bikes between boulders and up and along a shorefront to reach a bridge with this view of the open water between the lake and pond. The air temperature had warmed up to the 40’s by 10 AM, when the snow began to get too soft. At one point we had to, “ hike-a bike”, including a section over the well built and maintained Earl Pearse snowmobile suspension bridge. 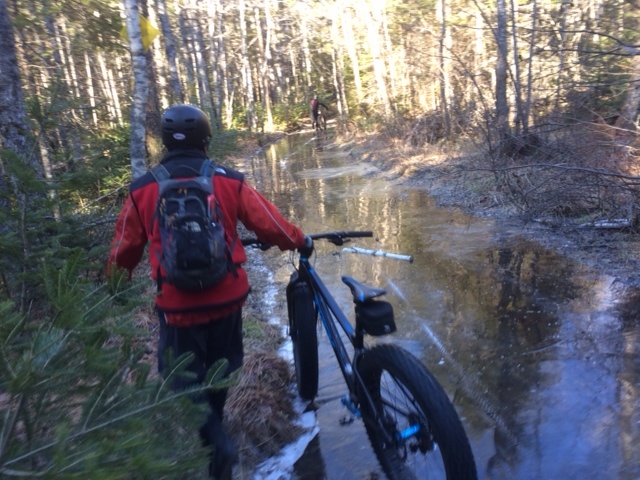 We had hoped to ride over Hobbs Pond to check out a couple of camps on Luce Lane, but by this time, I was spent. 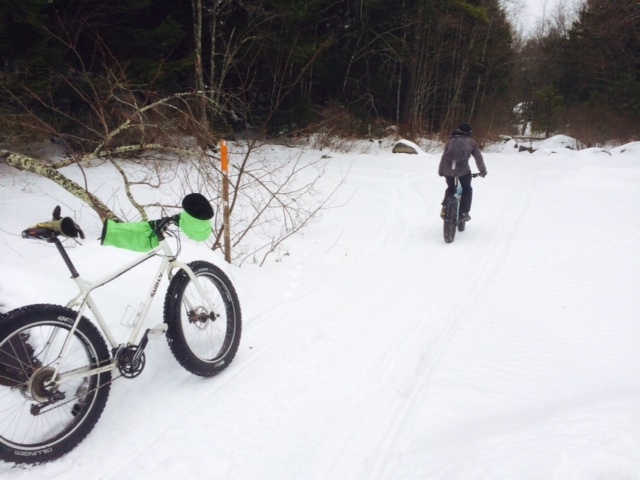 It takes twice the energy to ride trails in the woods on the snow in winter than it does to do the same routes on drier ground. We exited the snowmobile trails and rode Barnestown Road and then 235 back to our cars. I got twenty-two miles and four hours of activity outside in the last two days. Screw the gym. On Sunday, I never ventured further than three miles from my house, on new trails that have somehow escaped me for the past 37 years. Adventures are close by. Me and my trusty Pugsley are looking forward to more of them, hopefully tomorrow. I should write a book, after my sorry episodes following “outdoor misinformation” while backpacking across 22 States. Now that I am one of those actual Maine Guides that tend to dress in plaid wool jackets (as of Nov. 2014) , I see this from a different angle. It’s true- I no longer publicize some outdoor places that I love best ( because there are times when there are too many people for me to stay there), but it’s also true that I share this info with people who I feel need to know it. 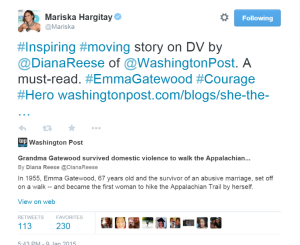 Reposting this article from Outside, written by Ian Frasier. Here–>>“Trust Me: In These Parts, Hot Dogs Actually Repel Bears.”. Four Dog Stove | Talk with Tom Jamrog | Winter Camping Symposium 2014 – YouTube. In October I went to Minnesota as the Keynote Speaker for the Winter Camping Symposium. My presentation was entitled Adapting Winter Skills to Survive Snow Conditions on the PCT and CDT. I also assisted with sales and answering gear-related and technical questions at Four Dog Stove‘s vendor booth during the weekend. 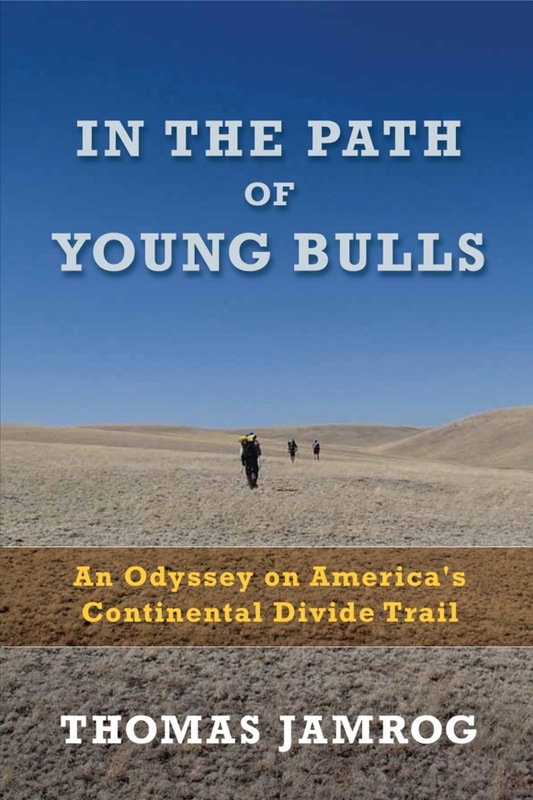 I appreciate the sponsorship given to me by Don Kivelus during my two most recent thru-hikes: The Pacific Crest Trail (2010), and in 2013, the Continental Divide Trail. In this brief video, Don and I discuss our mutual upbringing in farm families, the lack of spontaneous outdoor play in many communities, and my impressions about a most enjoyable weekend and meeting new friends while learning skills and techniques for enjoying the outdoors in all seasons. Who would believe it? Just a week or so ago, the lakes and ponds in midcoast Maine were still open. But all that changed his past week when the temperatures dropped below freezing for several days in a row. Once outside temps reach zero, an inch of new ice gets added on ponds and lakes in one day. Today was a day to be ready for serious cold. At 7 in the morning, it was three degrees at the house. 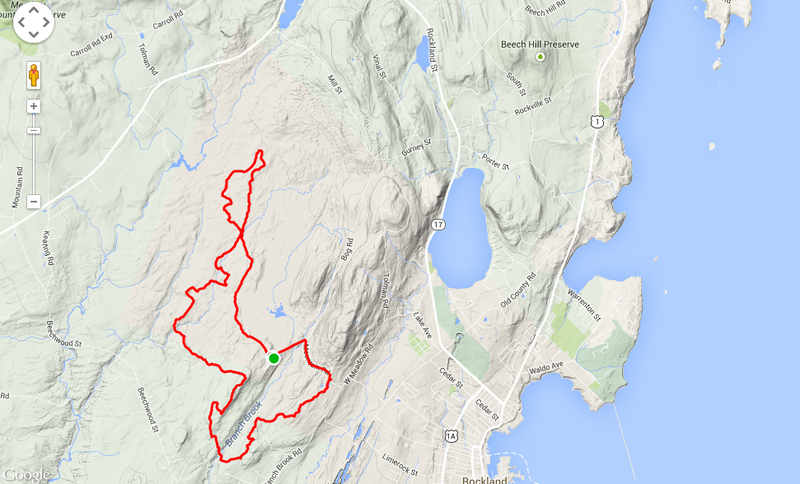 It got up to nine when I left to ride the trails around Ragged Mountain, just 15 minutes away. Bubba Church is usually Sunday morning, but there going to be a badass mess of snow, sleet, freezing rain, and then rain, so our ususal Sunday ride came one day earlier this week. I am using a couple of new products while riding the bike this winter season. 1)First, let’s talk feet. I don’t bother with expensive insulated boots that are specific to bike riding in the deep cold- for example, 45North’s Wolvhammers list for $325. They have cleats that allow you to clip into your pedals. 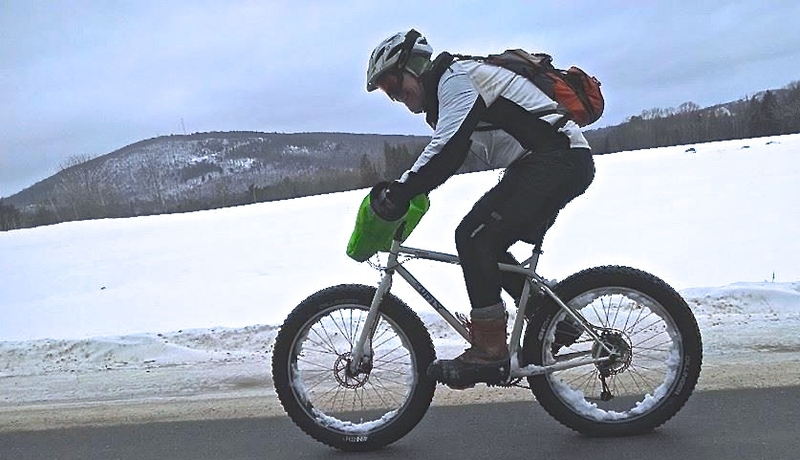 Instead, I run a pair of $12 plastic flat pedals on my Pugsley fat bike, wearing my trusty 15 year old LLBean insulated winter boots- they are plenty roomy with one pair of thin wool Darn Tuff socks. The new product under my feet is a mesh plastic insole that creates an airspace between the bottom of my foot and the removable boot liner. 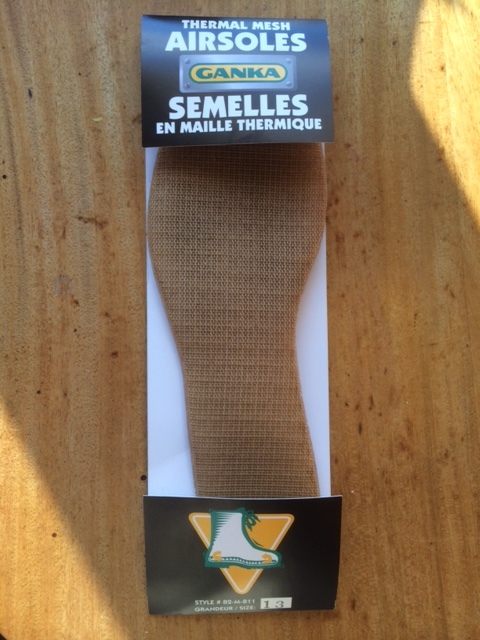 The insoles have 4 layers of plastic screening inserted between 3 layers of finer screening. I find my socks stay drier, and that I have warmer feet when using them. I got mine through Ben’s Backwoods, a very good place to purchase practical items for those of us that spend time in the northern forest, all year long. 2) Another combo that works for me this season is inserting chemical hand warmers into my handlebar pogies. I have a pair of high-vis green Cordura three year old Stellar Bags pogies made by a Minnesota cyclist who no longer sells them but there are plenty of others out there on the market: Revelate Designs, Dogwood Designs, Bar Mitts and Gup Gum Gear. Pogies do a great job of protecting my hands from the elements, especially the wind which can cool down hands fast and they let you ride wearing lighter gloves. When then temps get really cold, I activate and then insert throw-away chemical hand warmers into the pogies, and continue on with light wool gloves. However, I didn’t like buying and throwing away cases of the hand warmers ( really- 12 pack cases). 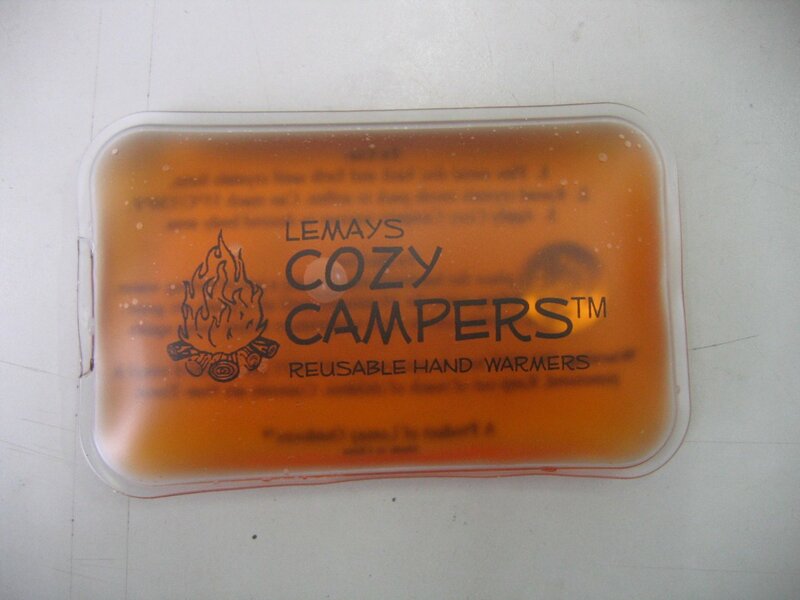 One of the vendors at this year’s Snow Walker’s Rendezvous had reusable hand warmers that are made in Maine. The product is Lemay’s Cozy Campers. These are reusable sodium acetate hand warmers that are activated by flexing a metal disc that is suspended in the gel medium. Ten minutes of boiling after use recharges the units for the next time. I have been using this product for 4 times now. It gets warm really fast, but has a much shorter warming period than the metallic mesh throw-away hand warmers. Since my rides are no longer than 3 hours total outdoor time, they are fine for what I do, but if you are out all day and need many hours of warm hands, then they may not be the best choice. The Camden Snow Bowl, our ride destination today, is still under massive reconstruction, and any riding needs to stay away from the build zone. Our 11 mile ride today began with a serious climb up past the left side, via the top of the toboggan run onto 22 Tacks, then linked up with the Ragged Mountain Runoff bike race loop. From there, we did Jason’s Trail, then onto the seldom traveled Milk and Cookies, until we descended on the Five Brooks trail to the excellent new network of swoopy singletrack at the base of Rollins Road. There is no parking at the end of Rollins, so while part of the group rode the road back to the parking area at the tennis courts at the Snow Bowl, Jason, Ian , and I bushwhacked out way to the left around the outlet from Hosmer Pond until we got to the solid ice and then proceeded to whoop it across the half-mile of black glass to our cars. Wow! Ice this clear and smooth is rare. 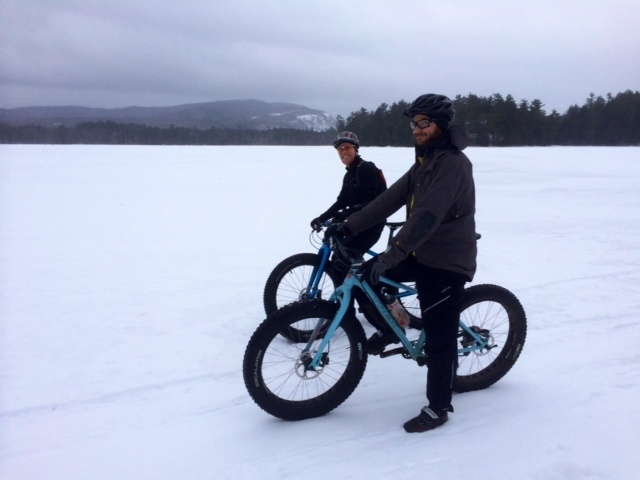 I’m running studded tires, but Ian and Buck didn’t need then as they rode up onto two of the granite islands and powered-slid around on the ice as we made our way back to the cars in the other side. Big big smiles as we powered north on top of the water ! I don’t care much for New Year’s resolutions. I prefer making my own resolutions throughout the year, whenever I’m inspired to do so. I also have not read any Pico Iyer since completing his groundbreaking 1989 Video Night in Kathmandu: And Other Reports from the Not-so-Far East. Iyer’s stunner article made me change my mind. It won’t take you long to read it, but I suggest that you so so. 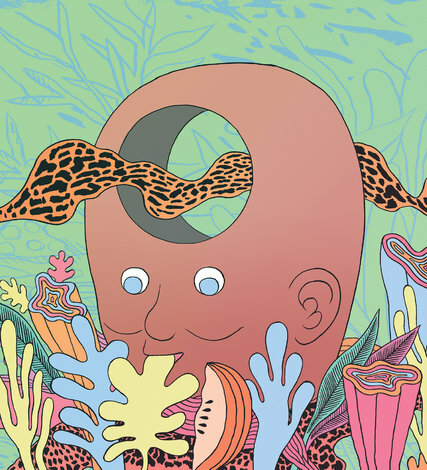 –>>Healthy Body, Unhealthy Mind – NYTimes.com. I’m now going to try to read at least 30 books this coming year, along with 360 hours of combined walking, backpacking, and bicycling. I also updated to Strava Premium where I plan to rig up the heart rate monitor (yet again). The slant of Iyer’s article is to redirect your cosmic magnifying glass on your own mental fitness. I am a true believer, and back that up by practicing Transcendental Meditation for one hour a day, as I have since 1970. I shot over to Pico Iyer’s highly beautiful and inviting blog, and look forward to spending a number of hours checking out what Mr. Iyer been up to since we last broke internal ranks. On thing for sure, I will be launching into his latest book tonight, “The Art of Stillness: Adventures in Going Nowhere.”. I just zapped it onto my Kindle. Fitness is all around us- we even get to stumble back onto that path, whenever our resolutions take form. 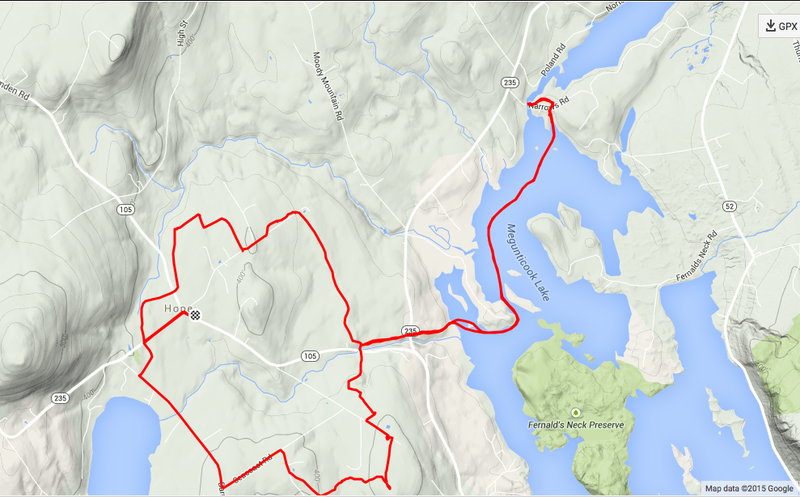 First ride on the first of 2015- 11.5 miles long. Seven Bubbas showed up. 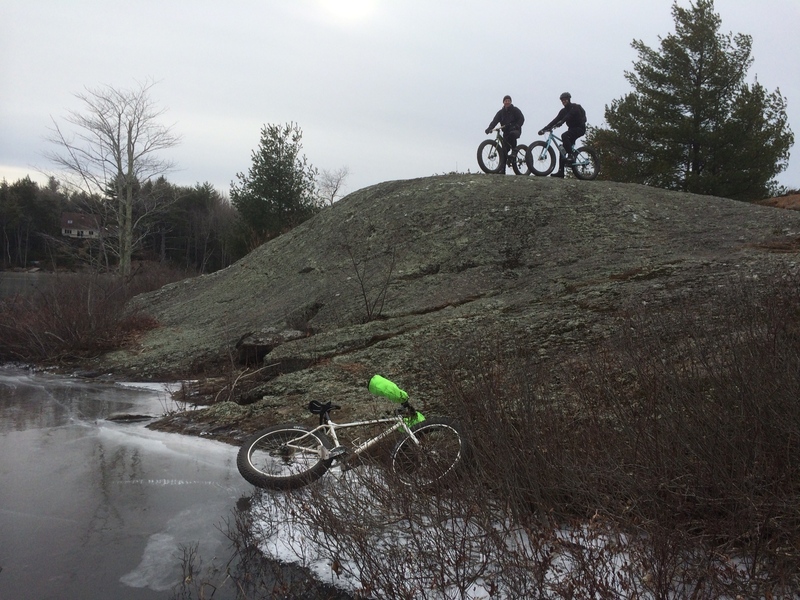 The initial part of the ride saw a great deal of hoar frost, large white ice crystals that are deposited on the ground. They form on cold, clear nights when conditions are such that heat radiates out to the open sky faster than it can be replaced from nearby sources such as wind or warm objects. Clumps of earth and even rocks cool to below the frost point of the surrounding air, well below the freezing point of water. In he picture below you can see some of the crystals, some up to 5″ long, mixed into frozen earth. Whoever is riding first through these patches has the hardest time, as the wheels sink through the surface of the leaf-covered crust until they reach solid ground. It’s harder pedaling- in a group, the guys at the back benefit from the work the riders up front do as they level the track. Today there was plenty of black ice- clear and smooth. That’s not water on top. 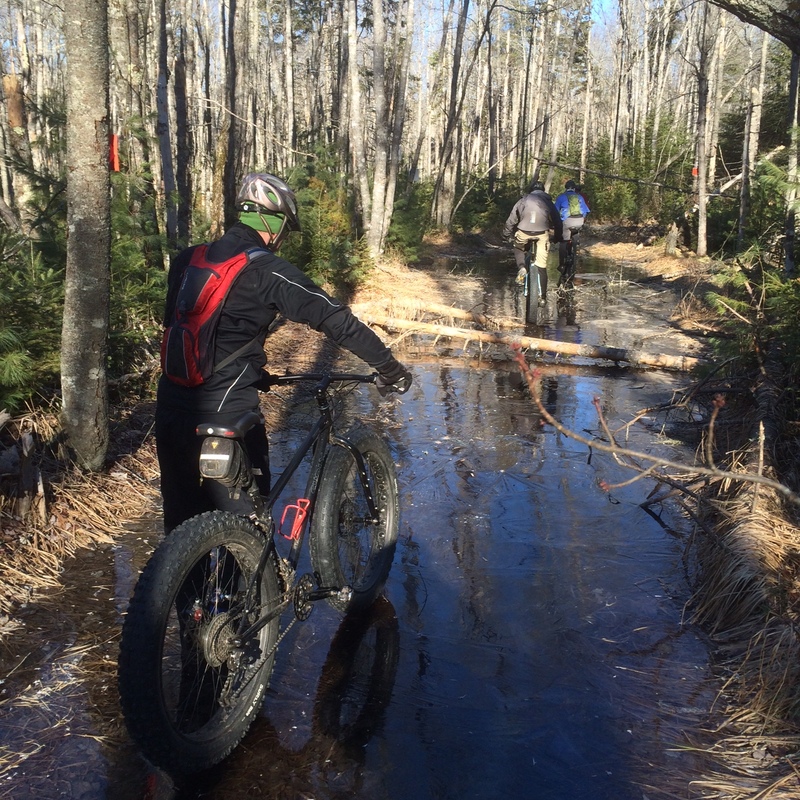 One of the extensions that we rode today had not been cleared of downed trees from our two ice storms. We’re not going back there until the local snowmobile club hauls out chain saws to clear this trail. In the photo below, notice the faint trace of a line on the ice to the Nate’s right. A couple of us had studded tires. It’s the track from Craig Mac’s Schwalbe studded 29″ tires on his Santa Cruz Tallboy. 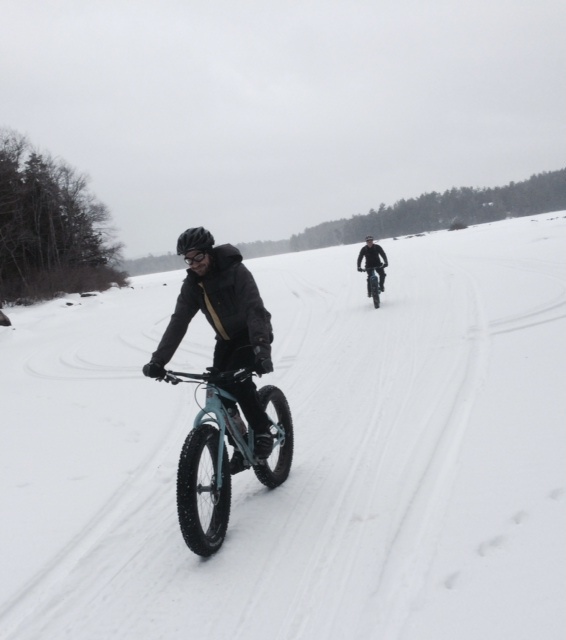 I was also able to ride straight over the ice with my 45North studded 4″ tires. 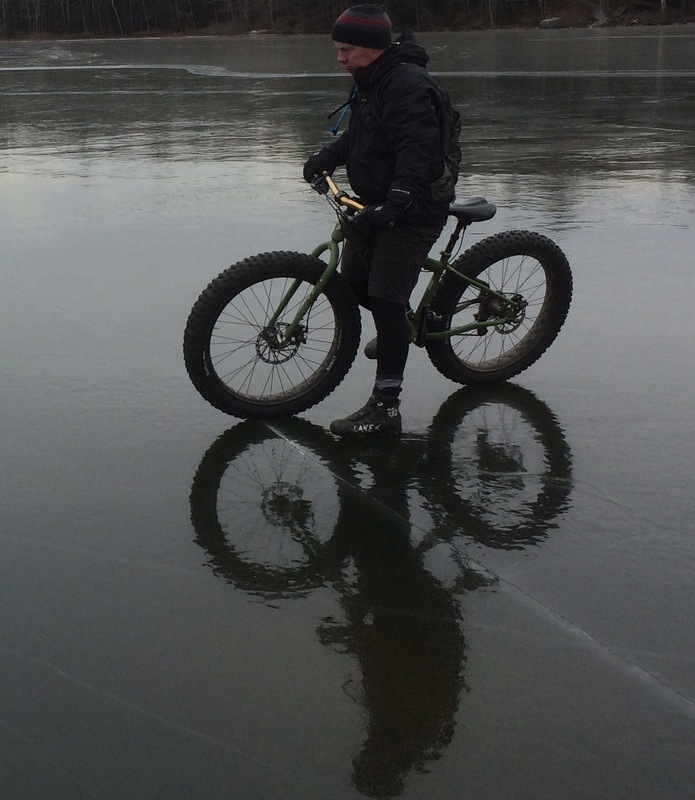 The crunch of the carbide studs on the ice underneath my Pugsley is a very satisfying sound. I rode well today, despite having no drinking water with me. I have been experimenting with eating and hydrating less on these relatively short rides the last few months. If I drink a full quart of water before I ride, don’t overdress, and don’t sweat too much I seem to do fine. The actual moving time for even this 11 mile ride was two and a half hours. Downed spruce trees forced a lot of hike-a-bike, and detouring through the edges of the forest. Eric was not at his usual position near the front of the ride, but he was working a New Year’s Eve excuse . Next up in 2 days is a rare Saturday Bubba ride. There’s a big storm coming in Sunday morning ( the usual schedule), so we’re adapting with a schedule change. There was bit of chatter today about our goals for 2015. For me, I am hoping for 360 hours of combined biking and hiking in 2015. It is a tough goal, but after today, I’ve already banked 90 extra minutes ! Start 2015 off by doing the right thing and purchasing your very own Maine State Parks Pass (day use). Veterans and those that are 65 (and over) get in for free! I just sent in my $35 , primarily for bypassing the $3 daily fee to hike the extensive and superb trails in nearby Camden Hills State Park. 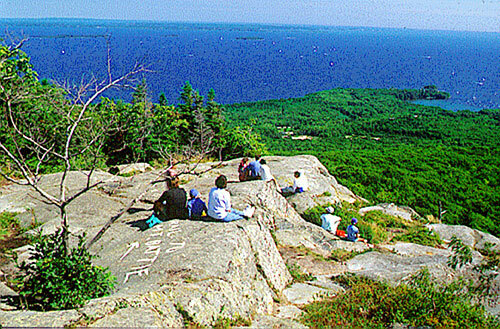 The great State of Maine has over 700,000 acres of Parks and Public Lands, with a huge variety of locations. Their updated web site is easy to use and very helpful in planning your encounters in the outdoors. 2015 is my year to stay local, and have #microadventures. I am very excited about the approach taken by Alistair Humphrey in his soon-to-be-released paperback ( Feb 3, 2015) Microadventures. The Kindle edition is available in the USA via Amazon. The book is my favorite outdoors read for 2014. Check it out. It’s highly British, but the approach can be adapted anywhere. Nature is the Real Gym !